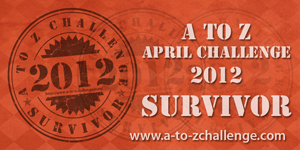 So the A to Z Blog Challenge is over for another April. Not sure what I'll do next year, but I am sure I am going to plan ahead for it better. Yes. I joined several new-to-me blogs and found a bunch of books I wanted to read from my travels. Highlights for this blog was to get the word out on so man great games out to people that didn't know about them. Lowlights...trying to do this for two blogs at the same time! I tend to post everyday anyway. Biggest hurdle was coming up with something appropriate for the letter in question that also fit with my theme. I had a large number of topics to cover and still have some ideas left over. It did cut into my schedule quite a bit to be honest. I had a theme and I stuck with it. But I had thought about it a lot and tried to find topics ahead of time. I tried to visit every blog in the challenge. Yes, I ran into a number that had Word Verification still turned on and it was annoying. Though much worse than that were the people the had to approve my post/comment and then never did. I keep word verification turned off. I would rather have it easier for my readers than worry about spam. Try to get more posts in before April! Craft the posts in such a way to encourage more feedback. There were a number of "dead" sites on the list and some were some that didn't link to their blog, but some other page. You might want to get more Co-Hosts next year to help clean out the non-participants (the ones that signed up then never posted) and dead links. So I ended up with a bunch of new followers. 50 on the Other Side and almost 20 on Freedom of Nonbelief, and very little overlap between the two. Page views were highest in the start of the Challenge and then tapered off a bit. I'll participate again next year. Congratulation on finishing the challenge. Wow, you've done it twice!